Affordable and Reliable Trips to The moon and Mars? NBC.com’s science editor, Alan Boyle, talks with Doug Griffith and Taber MacCallum about achieving affordable, reliable and frequent human expeditions to the moon as well as Mars. Is Oz the great and powerful a must-see? BFCA film critic Marc Eastman and co-host Shane Leonard review Oz the Great and Powerful as well as Jack the Giant Slayer. Fans of ABC’s The Bachelorette, tune in to one woman’s quest to become ABC’s first black Bachelorette. Dr. Misee Harris chats about her goal and what it would mean to her. At 61, Tom Wopat, Luke Duke in the original Dukes of Hazzard, still sings like a bird. He’s got a new CD of standards out, and a Christmas CD with DOH co-star John Schneider planned. 2013 is the Year of The Gathering in Ireland, and many Americans and Canadians have Irish roots. Travel Brigade gives you the best tips on tracing your family history. This entry was posted in Overheard on BlogTalkRadio and tagged ABC's The Bachelorette, diabetic meals, Jack the Giant Slayer, Oz the Great and Powerful, spring break, St. Patrick's Day, SXSW, Tom Wopat, travel to ireland on March 11, 2013 by blogtalkradio. We were so happy to see BlogTalkRadio hosts Jessica Durivage and Diane Ferraro on a panel at SXSW this year. They host and run Where Is My Guru, a weekly radio show and social media hub committed to making positive social change through the lens of yoga, community, leadership and service. Their panel entitled “Radio Free Yoga: Self-Realize x Social Enterprise” featured some outstanding guests in the world of yoga, film and spirituality including Seane Corn, Vikram Gandhi and Waylon Lewis. The discussion explored how the worlds of social media and spirituality can intersect to affect personal growth and philanthropic progress. We were lucky enough to attend the panel and get this shot of it in action! It was a fascinating discussion and kudos to the girls on getting their panel into SXSW this year! Don’t forget to tune in to their show live this Friday at 11AM EST for a recap on their SXSW experiences and an interview with Sue Jones, yoga rebel and founder of yogaHOPE. This entry was posted in BlogTalkRadio, Daily Highlights, Health, Host Highlight, New Media Tools, Social Networking and tagged Diane Durivage, Jessica Ferraro, Seane Corn, spirituality, Sue Jones, SXSW, Vikram Gandhi, Waylon Lewis, Where Is My Guru, yoga, yogaHOPE on March 15, 2012 by blogtalkradio. At 1230 PM Join The PulpLizard Show‘s second annual live coverage of the SXSW Film Festival in Austin, Texas with film reviews, exclusive interviews, and guest hosts from the event. At 230 PM Indie Lady A welcomes singing sensation Sara Haze, who has been belting out songs since the age of five, to talk about her big break, and her latest musical projects. At 6 PM Special guests include Todd Lally who’s running against incumbent Democrat John Yarmuth in Kentucky’s 3rd Congressional District and Keith Messina who’s vying to unseat incumbent Democrat Barney Frank in Massachusetts’ 4th Congressional District on the Conservative Republican Forum. At 8 PM Flashback with Carey Fisher welcomes actress, singer and model Debbie D to discuss her film and modeling career as well as her love and involvement with the horror film genre. At 10 PM Annie and Burl once again tackle the serious topic of driving under the influence as they host the 2nd Annual ABL Drunk Show, with breathalyzer tests, drinking facts, and when to know how much is too much. At 11 PM SportsTalkSoup reviews the NCAA Tourney with Eric Angevine, the managing editor for Storming the Floor, who gives his early predictions for who will win it all, as well as the teams that could pull off an upset. This entry was posted in BlogTalkRadio and tagged Annie and Burl, Barney Frank, Conservative Republican Forum, Debbie D, Eric Angevine, Flashback with Carey Fisher, Indie Lady, John Yarmuth, Keith Messina, NCAA Tourney, Programming Highlights; BlogTalkRadio, Sara Haze, SportsTalkSoup, Storming the Floor, SXSW, The PulpLizard Show, Todd Lally on March 13, 2010 by . BlogTalkRadio is Back From SXSW! I just had the most amazing few days. I spent some time in the beautiful city of Austin, TX at the South by Southwest Interactive festival. To say the experience was a positive one is an understatement. I, along with BlogTalkRadio’s John Havens and Chris Hogan, spent time talking with some of the greatest folks on earth. I wish to personally thank all of our hosts and listeners who stopped by the BlogTalkRadio pod at the Pepsico Podcasting Playground to tell us how much they enjoy what we do. Your support means so much to us. Meeting you face to face means even more. I would also like to take this time to say “welcome aboard” to our new hosts, especially those of you who signed up after talking with us at SXSW. A special shoutout to the folks at PepsiCo who provided us a unique place to interact with the community and broadcast live, and also to WalMart’s 11Moms. You may know some of the 11Moms as BlogTalkRadio hosts. In person they are smart, savvy and delightful, and I enjoyed all the time I spent with them. I look forward to seeing you all again! Another shout out to Chris Brogan for becoming a part of the BlogTalkRadio team for the weekend. It’s always a pleasure chatting with you. I met community management folks from brands such as Best Buy Remix and we’re already brainstorming ways to bring our communities together. I was also able to pick the brains of the best minds in social media. I learned so much, I’m ready to burst. Thank you South by Southwest, thank you Austin, thank you to the BlogTalkRadio community and a very special thank you to BlogTalkRadio for allowing me to attend this extraordinary event. This entry was posted in BlogTalkRadio and tagged 11moms, BlogTalkRadio, Chris Brogan, pepsico, SXSW, sxswi on March 18, 2009 by blogtalkradio. Check Out BlogTalkRadio’s Podcasting Pod at SXSWi! As we mentioned earlier on this blog, BlogTalkRadio and PepsiCo have teamed up to broadcast live for most of SXSWi at the PepsiCo Podcasting Playground. Located on the first floor of the Austin Convention Center, the Playground features four quiet podcasting pods and refreshment area. To get the PepsiCo Podcast Playground, make a right upon entering the Convention Center’s main doors and follow to the end. Make a left and keep going (and I mean keep going!) until you find us! To listen live, beginning this evening, and all through the weekend, bookmark BlogTalkRadio and PepsiCo’s Digital Speakeasy. Plus I’ll be adding video and images to this blog throughout the weekend. This entry was posted in Conferences and tagged BlogTalkRadio, pepsico, PepsiCo Podcast Playground, SXSW on March 13, 2009 by blogtalkradio. 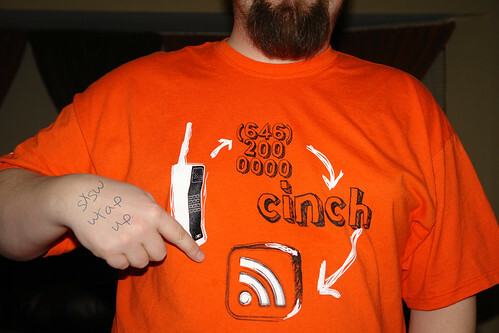 A flickr user, choiceshirts, favorited one of the four Cinch designs today. Thank you! At SXSW in Austin, TX a couple weeks ago the BlogTalkRadio team was there to represent and produce shows for our hosts like DoC and Wiley. We handed out hundreds of BlogTalkRadio stickers (made by the great Sticker Giant) and over 130 original Cinch t-shirts to attendees. The shirts turned out to be an unexpected hit. Sure, we thought we could give out quite a few but we expected to have many left for other events – not the case. It made traveling home easy! The takeaway from this post should be that if you are designing promotional products make schwag that doesn’t look like schwag and that your conference team will get behind with a passion. Get feedback from your co-workers about designs and ask them if they would wear or use the item you are creating while not in the presence of your CEO. And, lastly, know your intended audience. This entry was posted in Blogosphere, BlogTalkRadio, Cinch and tagged Cinch, conference schwag, Hilary Leewong, SXSW on March 21, 2008 by .